LEDGlow’s 60” Tailgate LED Light Bar enhances your full size truck’s factory signals, making them more visible for other motorists on the road with ultra-bright SMD LED technology. 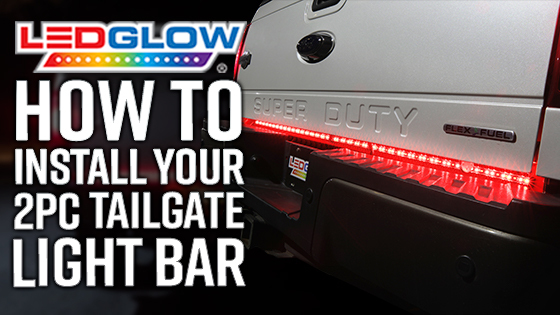 LEDGlow’s 60” Tailgate LED Light Bar will keep other motorists off your tail with ultra-bright SMD LED technology, while also alerting them of every move you make on the road. This LED tailgate light bar is impossible to miss on the road by featuring 72 red SMD LEDs that are used for running, brake, turn signal and hazard light functions, along with 36 white SMD LEDs used for reverse light signal functions. Featuring a 2pc 30" interlocking, rigid design, this tailgate light adds a unique style and safety feature to your full size truck that is second to none. This truck tailgate light bar was built and designed with longevity in mind. The SMD LEDs are encapsulated in clear polymer resin that fully seals and protects them against the elements, giving this light bar an IP68 waterproof rating. An O-ring is used on the left half of the light bar that helps further seal the connection point of the two light bar pieces, preventing water or moisture from entering. Housed in a durable, aluminum body, this light bar will withstand any job or adventure you and your truck throw at it. Installing this light bar is as easy as connecting the two pieces together, mounting the bar, plugging in the flat 4 pin connector and you’re set! The flat 4 pin connector features 3-1/2’ of wire and plugs directly into the trailer plug of your full size truck. A white wire with a spade connector is attached to the harness that allows you to use the white reverse lights function. Simply use the included splice connector on the factory reverse lights wire and insert the spade connector into the splice connector. It’s that easy! All the installation hardware you need is included such as 4 strips of double sided adhesive tape, 6 self-tapping screws and step-by-step instructions. 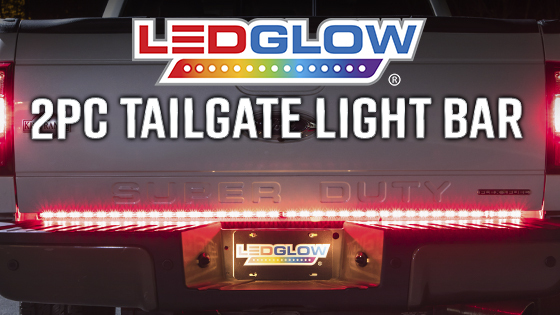 If you are installing this light bar to your truck, but your flat 4 pin connector is already being used, LEDGlow offers a y-splitter harness that allows you to use your light bar along with your trailer lights simultaneously. This y-splitter harness features a length of 18” with 9” of wire for both tailgate light bar and trailer lights connections. Installed this Light bar on my 01 Silverado and Love it !!! Great product, works and performs well. Would highly recommend. 3rd Light will also, be a charm !!!! This is my # 3 LED GLOW rear light-bar..
First one on a 2011 Ford F150 left on when traded trucks..
Have been more than happy with the LED light bar. Couldn't ask for better customer service..
Nice looking aluminum framed 60" tailgate LED unit. Since I just installed this LED light bar, I have no info on longevity. It is much improved over the version I replaced from 5 years ago. I think this unit will last much longer than the one I replaced based on the improved design. Hardwired to truck harness. Total time to install and hardwire about 1.5 hrs. Easy to install and looks great! Hardest part is finding correct wiring on a GMC Denali. If you want, you can just plug them in and use no reverse lighting.